Being an American brand, Hamilton Beach is quite popular especially in the United States and Canada. In this article, we will help you choose between two budget-friendly coffee makers from them, which are Hamilton Beach 46205 vs 46310. These two models are both 12-cup coffee makers. However, there are several key differences that make one much better than the other. First of all, let’s begin from the dimensions of each coffee maker here. Though this may seem like a trivial matter, you need to make sure that the product that you choose can actually fit into your kitchen. Otherwise, if the unit is too large for the available space, you may end up in a dilemma. See also: Mr Coffee Optimal vs Cuisinart. 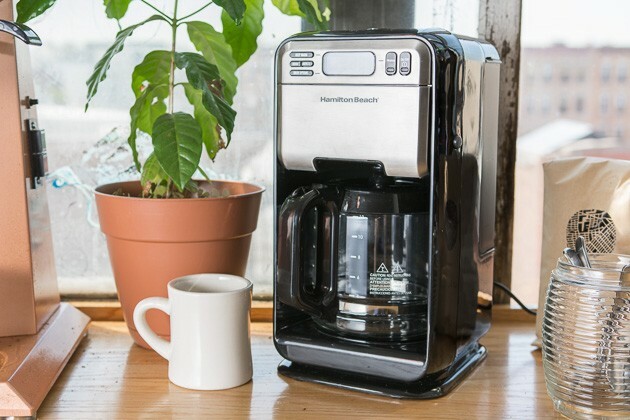 Hamilton Beach 46205 coffee maker measures 13.78 inches tall, 7.41 inches wide, and 9.26 inches deep. Compared to Hamilton Beach 46310, Hamilton Beach 46205 is slightly smaller and more space-friendly. So, it is a slightly better choice if your kitchen has a space limitation issue. In a glance, Hamilton Beach 46205 looks simple. However, it still looks modern and stylish. On a closer inspection, you will notice cool properties in the design of the coffee maker. On the top side of the front panel, there is a blue backlit screen that is easily readable in any lighting condition, along with several control buttons. It has a swing-out brew basket on the front to allow you to refill the ground coffee easily. In addition, the coffee maker can swivel around to reveal a removable water reservoir. Hamilton Beach 46310 measures 13.9 inches tall, 7.95 inches wide, and 12.91 inches deep. Indeed, this model is larger and bulkier compared to its sibling that we previously discussed. So, this model is more suitable for a kitchen that has plenty of free room. Hamilton Beach 46310 looks modern and stylish, but unfortunately the display screen on the front is not backlit. In addition to the display screen and control buttons, the front panel also features a swing-out brew basket for easily refilling ground coffee. The water reservoir is accessed from the front. One important difference between Hamilton Beach 46205 vs 46310 is the design of the water reservoir. It is true that they both are 12-cup coffee makers. However, the sophisticated design of Hamilton Beach 46205 has made it a lot easier and more practical to use than Hamilton Beach 46310. Hamilton Beach 46205 has a removable water reservoir to allow easy refilling. You can just take out the water reservoir and carry it to the water source. Although the water reservoir is located on the back, you can access it simply by twisting the coffee maker around on the swivel feet. Since the wall is transparent, you can easily monitor the remaining water level. In use, Hamilton Beach 46205 is definitely very practical. You can just twist the machine around in order to access the water reservoir, and the removable design means that you don’t need a separate tool to hold and carry the water. Compared to its sibling, this coffee maker is quite easier to use. Hamilton Beach 46310, on the other hand, has an unremovable water reservoir. The coffee maker’s water reservoir can be easily accessed from the front by flipping a lid. According to the company, this design eliminates the need to maneuver a coffee maker back and forth to refill. It also has a transparent water window to allow you to monitor the remaining water level. Although the design sounds great, you will probably find that Hamilton Beach 46310 is not as easy to use as Hamilton Beach 46205. The problem is, you need a separate tool to carry the water and pour it into the machine. The lid sometimes can be annoying to open and close. In terms of programmability, Hamilton Beach 46205 vs 46310 are similar. Both of the two coffee makers can be programmed to brew coffee automatically. They both also have adjustable brew settings. With either model, you can set a timer on the clock at night before you sleep so that the coffee maker will start brewing your morning coffee around the time that you wake up. This feature is very useful for many people. Often, you don’t have enough time to spare in the morning for manually dialing and brewing coffee, so having a programmable coffee maker can be incredibly convenient. On each model, you can also find three brew settings which will allow you to adjust the size and intensity of your brew. However, you need to cycle through several selections in order to get the settings that you desire. By selecting the “Bold” setting, you can increase the brew intensity so that you can get stronger and bolder coffee. Meanwhile, with the “Regular” setting, you can get coffee in a medium intensity level according to the default configuration. Finally, you can adjust the brew size for 1, 2, 3, or 4 cups in order to brew the coffee with just enough water in order to get the best brew quality. Both models here have the automatic pause and serve feature, which is really nice. Each model here is equipped with an anti-spill pouring spout to ensure a clean and neat operation, and the machine will automatically pause pouring if the carafe is removed from its place. So, you can steal a cup from the carafe without having to wait for the entire process to finish. Most of the additional features of Hamilton Beach 46205 vs 46310 are similar. There is just one exception, which is the cleaning reminder. If you can make yourself diligent enough to clean your coffee maker regularly, you probably won’t really need such a feature. But, if you are too lazy to track your last cleaning sessions by yourself, having a cleaning reminder can be invaluable. Hamilton Beach 46205, unfortunately, does not have a cleaning reminder. As the effect, it is recommended that you just clean the coffee maker regularly on a certain schedule. This way, you will not need to compromise on the brew quality and durability of the machine. Hamilton Beach 46310 does come with a cleaning reminder. It will tell you to clean the coffee maker every 30 brewing cycles. So, the chance that you forget to clean the machine will be significantly reduced, and this also ensures the life and durability of the coffee maker. Each of the two models here is equipped with a non-stick warming plate, which is useful for keeping the drink warm and enjoyable for a few hours after the brewing. Since the surface is non-stick, it is very easy to clean – just wipe it off. As explained above, each model here has an anti-spill pouring spout, so the number of spills can be kept at a minimum. Each model here also has a 2-hour automatic shut-off. This is a useful feature, especially for busy people who are prone to forgetting or missing things. Even if you forget to turn off your coffee maker before you go, it will eventually turn off by itself, thereby saving energy as well. Of course, keeping a coffee maker that is easy and practical to use is one thing. But it will be next to useless if the produced coffee quality is awful. Many people agree that most automatic coffee machines are crappy. 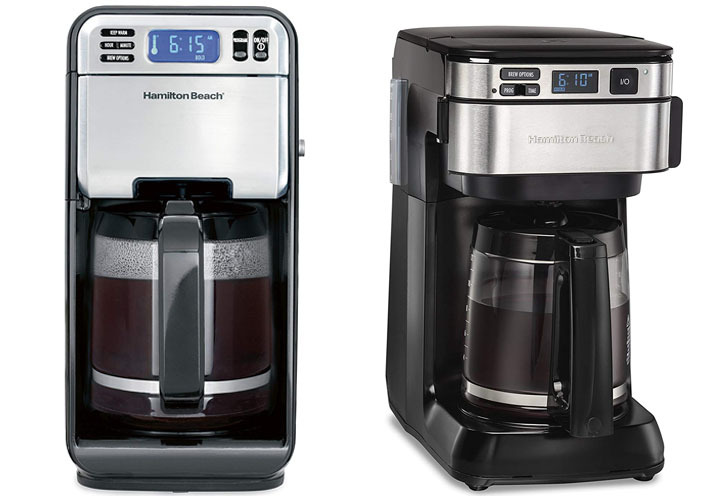 Hamilton Beach 46205 and Hamilton Beach 46310 are also not to be compared to those high-end units, but they both still can deliver pretty good coffee quality especially when on the “Bold” setting. After choosing the amount of coffee that you want (1 – 4 cups), you can choose Bold or Regular. You may need to try different combinations to find one that suits your taste and preference best. As a rule of thumb, the Regular setting is quite weak and plain, so it is only good for people who can’t take too much caffeine. The Bold setting is generally more recommended. The Bold setting will give you rich and flavorful coffee. There is some noticeable bitterness because the coffee is extracted by increasing the brewing temperature, but the overall flavor profile is still great. The produced coffee is really hot, which is a good thing. It will be kept warm by the warming plate for some time, so you don’t need to worry about losing your coffee. - FAST, EASY FILLING. Rotating base lets you easily access the rear water reservoir with just a quick twist. - PROGRAMMABLE CLOCK. Set it up the night before with the programmable clock and pour yourself a hot cup first thing in the morning. - ADJUSTABLE BREWING OPTIONS. 12 cup capacity with bold, regular, and 1 to 4 cup brewing options. - SWING OUT BREW BASKET WITH RELEASE BUTTON. 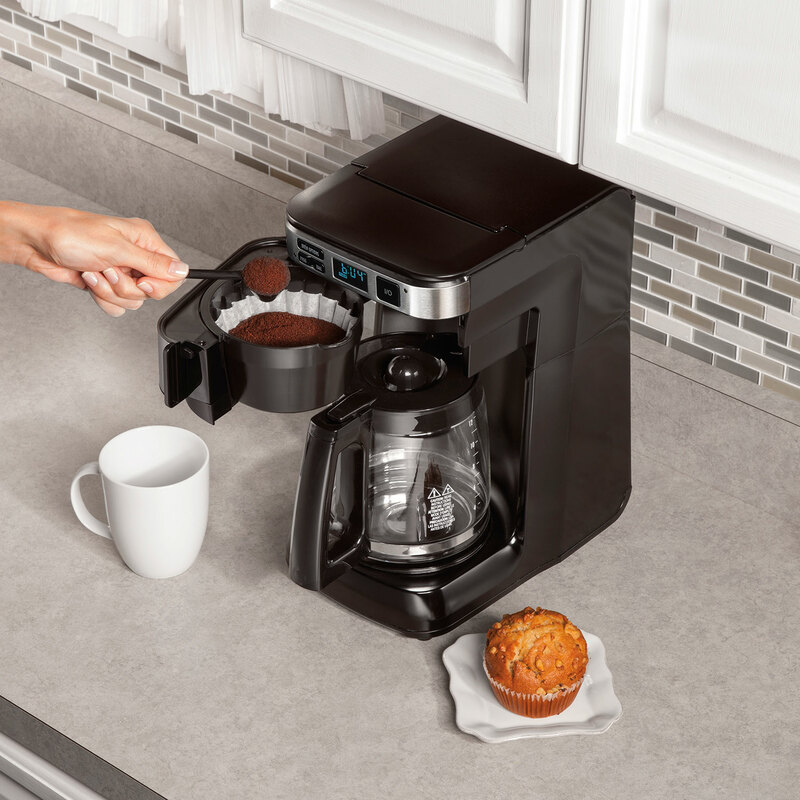 With the touch of a button, the brew basket releases from the front for easy filling of your favorite grounds. In general, we recommend you to choose Hamilton Beach 46205. It has a better design, and it is generally easier and more practical to use. It has a removable water reservoir for easy refilling. It is programmable, and the coffee quality is good especially with the Bold setting. coffeebeingsandthings.com is a participant in the Amazon Services LLC Associates Program, an affiliate advertising program designed to provide a means for sites to earn advertising fees by advertising and linking to thedietplan.net (amazon.com, amazonsupply.com, or myhabit.com).